A reputable spa business needs business cards to promote its services to its visiting customers and get more referrals in the long run. Most spa and wellness centers offer different therapeutic and beauty services like water spa, facial and body treatments, body and foot massage, waxing, and even home services. The design of the spa or wellness center card must determine the specific services that it offers. 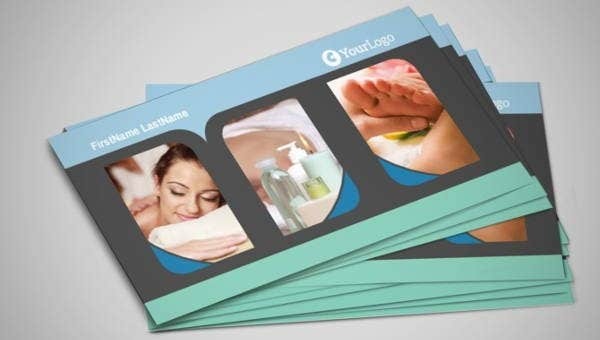 We have over six ready business card templates that will leave a lasting impression on new and even existing spa customers. Choose the right template below that fits your package of services and start customizing your very own business card. 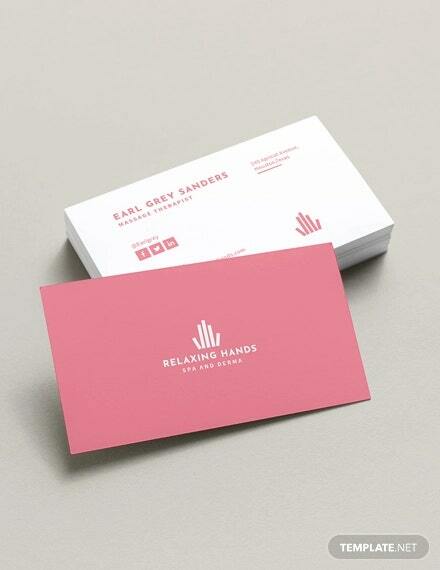 Massage Business Card. Want a sky-themed business card? Choose this relaxing sky-blue background card with translucent bubbles for spa centers with water spa massage services. Therapy Business Card. This therapeutic massage business card comes with a photo of a man’s back. This will highlight services like Swedish, prenatal, injury, and deep-tissue massages. Massage Therapist Business Card. 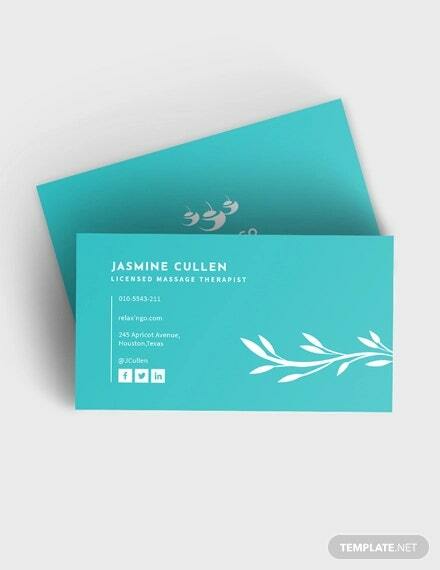 This business card template would be great for independent massage therapists that are mobile. It features a lotus flower drawing with a blue background. 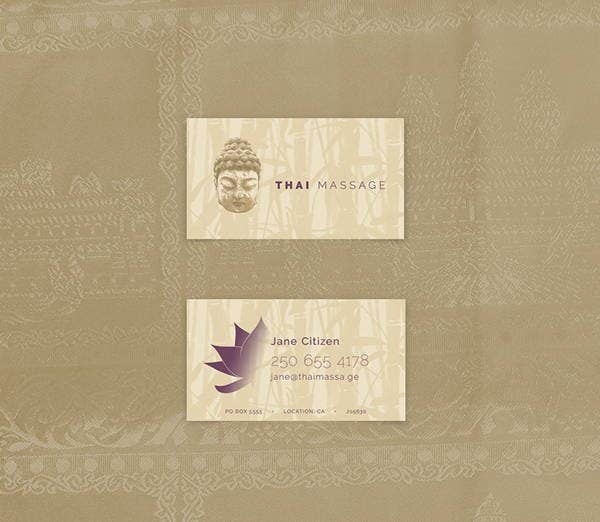 Thai Massage Business Card. Specializing in Thai massage? Check out this bamboo background business card with two sides and a Buddhist icon. 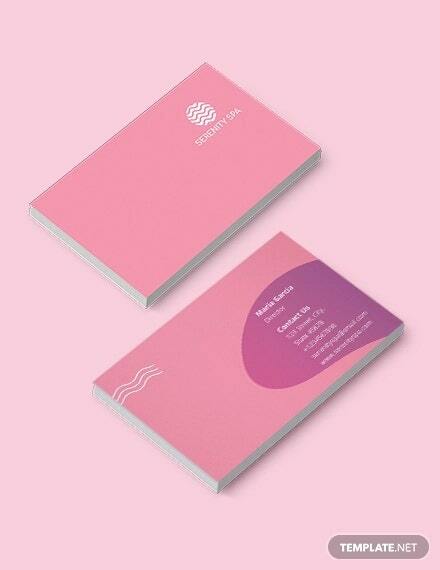 Spa and Beauty Business Card. Is a facial one of your signature services? 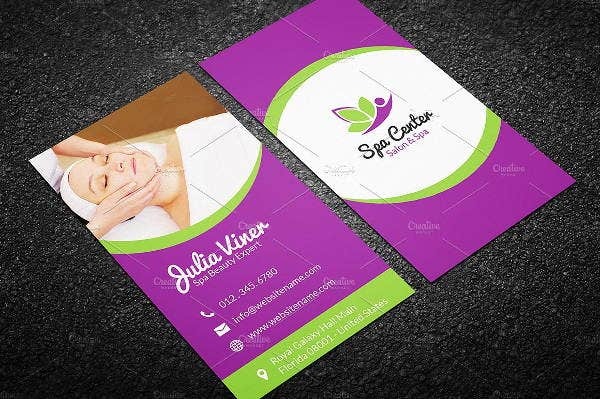 Try this spa and beauty business card template. Massage & Spa Business Card. Want a series of photos with a framed border and cool tones? 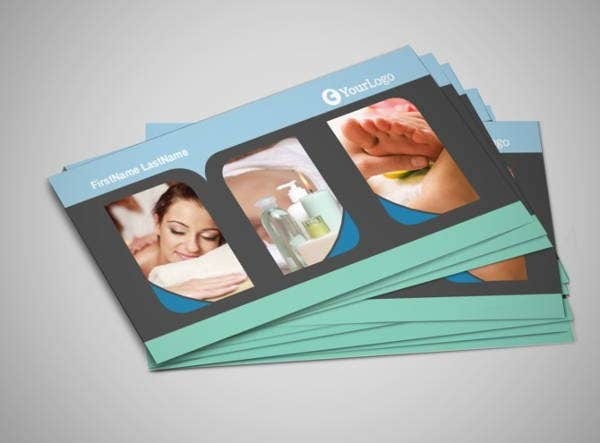 This massage and spa business card features three photos with your business name and logo. Printable Massage Business Card. 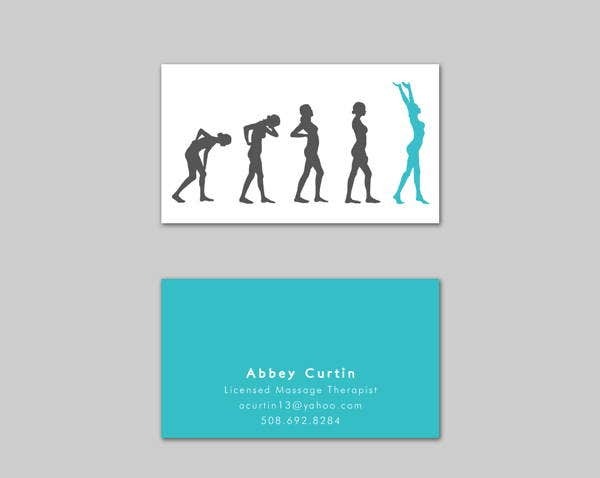 Demonstrate a wellness journey cycle with this catchy therapy business card. Our spa beauty and wellness business card templates can also be customized as fashion business cards since they have similar characteristics in design. Spa business cards can cater to different fields such as alternative medical care, cosmetology, skin care, and aesthetics. Most spa and wellness centers adapt a zen design because it is simply a standard in the wellness business. Zen design in spa represents a serene and comfortable environment and helps guests feel relaxed and energized after a spa session. Ornamental plants. 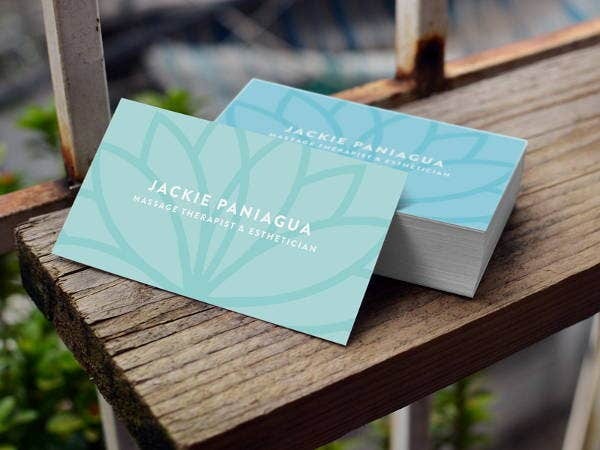 Ornamental plants such as orchids, dame’s rocket, chrysanthemum, and the popular lotus flower can be placed as design elements on your spa business cards. Sea salt. A bowl of sea salt can be a great addition to your plain business card design. Candles. Candles are a symbol of peace, which makes it a great symbol to go with your business card design. Beach background. 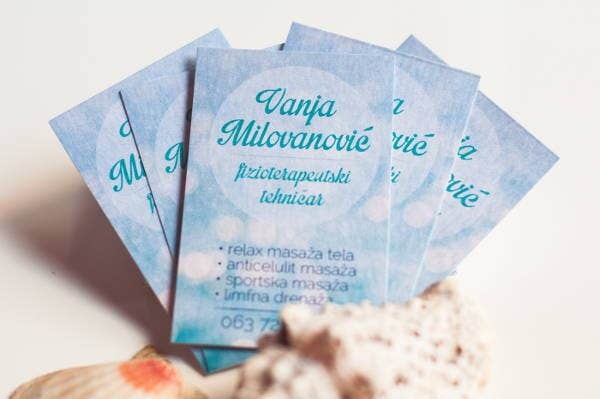 Some wellness business cards have images of the beach with a coconut tree and a person relaxing on the sunbathing area. Flat oval stones. These black flat stones represent a hot stone massage service. Bamboo. 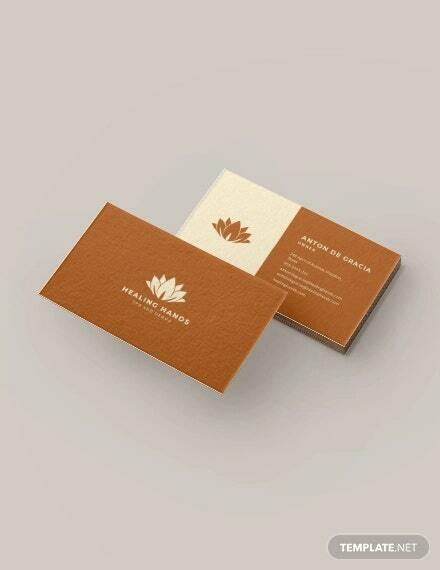 Bamboo is an icon of serenity, which makes it a perfect background or element to a zen spa business card. Find out more tips in making business cards with our ready-made card templates by viewing more of our blogs online.